The image on the left below is known as the Adda seal. It was found in Iraq and dates from c 2300 BC. 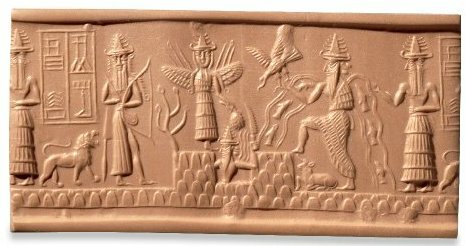 It shows the winged goddess Ishtar. 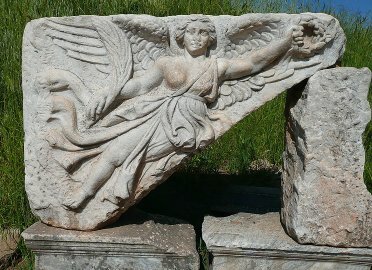 On the right is Nike, the Greek Goddess of Victory, at Ephesus. It wasn't just the visual image that influenced early Christian art, but the function of the various gods and goddesses. 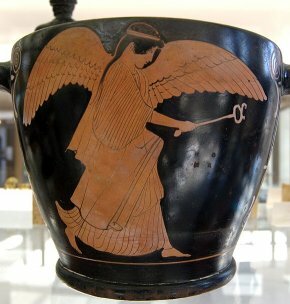 Nike reminds us of fighting angels, such as those defeating the fallen angels, though the gender has generally changed. This carved sarcophagus shows the idea of a victory goddess translated into Roman mythology. An important function of angels was that of heavenly messengers. The equivalent in Greek mythology was Iris, shown in the two images below. In Roman mythology, Mercury took over as messenger; his wings were usually confined to his shoes and helmet.